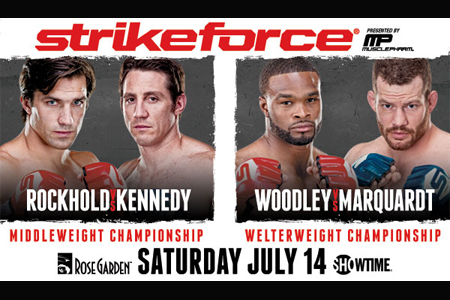 On Thursday, Strikeforce added a lightweight scrap between Ryan Couture and Joe Duarte to their July 14th lineup. Couture, the son of UFC Hall of Famer Randy, owns a 4-1 professional record. All of the 29-year-old’s bouts have come under Strikeforce’s banner. Duarte will be riding a five-fight winning streak into their 155-pound affair. He was last seen posting a unanimous decision victory over Jorge Gurgel in August. Rose Garden in Portland, Oregon hosts the extravaganza. A pair of championship affairs will headline the festivities. Middleweight champ Luke Rockhold defends his crown against Tim Kennedy in the event’s featured attraction, while Nate Marquardt and Tyron Woodley battle for the vacant welterweight crown.